ABSTRACT: The presented paper offers a short general introduction to frustration followed by a discourse on frustration as an integral part of gaming experience with the core distinction between positive in-game frustration and negative at-game frustration. The potential of frustration to increase motivation to play, emotional engagement and immersion is outlined. The paper includes comprehensive research using the means of a questionnaire (n=159) and content analysis (n=327) identifying types of frustrating situations in games, perceived sources of frustration, the behavioural impact of frustration and the relationship between locus of control and ascribed source of frustration. Results showed toxic behaviour as a leading cause of frustration. The most common declared behavioural output of frustration caused by the toxic behaviour of other players was quitting a game for a certain amount of time. Frustration showed the most motivational potential within the category of frustrating situations related to gamers e.g. being stuck in a part of the game, losing, not succeeding, etc. At-game frustration concerns mainly the category called the “game itself”. Most often the game was blamed for insuffi ciencies in game mechanics or game design, malfunctioning and technical issues within the game. The presented research did not show a statistically signifi cant association between the source of frustration and a participant’s locus of control. The paper has potential in terms of game design and research of emotion, motivation or immersion. KEY WORDS: behaviour, digital games, frustration, locus of control, motivation. ABSTRACT: The presented study dwells on the issue of game theory by Roger Caillois to be applied to the contemporary dimension of digital games. The actual attempt is to fi nd out the extent to which the game principle categories apply to media products, i.e. digital games. The paradigms by authors engaged in cultural anthropology, philosophy, psychology, and sociology, besides others, served as key theoretical groundwork for the present paper. Nevertheless, the theories concluded within media study addressing the game and game principles in contemporary society have not been excluded either. In essence, the theoretical refl ection introduces the basic terminology axis creating an apt platform for the game variants in use, to perform within the forms of new reality, i. e. virtual reality. The primary aim is to defi ne elementary concepts like “game”, “game principles”, “media or virtual space”, “digital game”, and “game genres”. Secondary is then to explicate certain game principles designated by Roger Caillois present in the particular game. Material to be applied for this study ranks among the genre of action games. “Action game” particularly is a digital genre that belongs to frequent genre types as well as RPG games, strategy and others. Drawing from this fact, one of the actual digital games called Mafia III was chosen for empirical study. 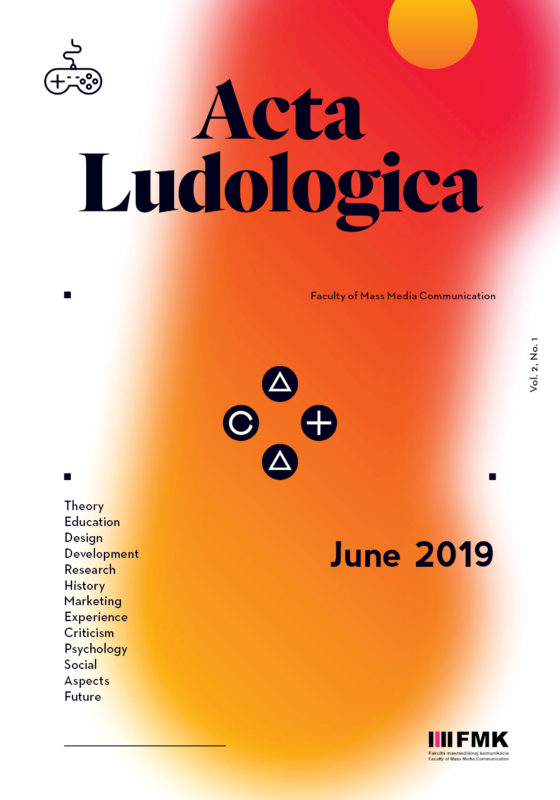 The main purpose of the paper is through logical analysis to illustrate the issue of games, and subsequently point out the cases of their occurrence in the media space. Theoretical postulates by Roger Caillois are by author assumed to be potentially applicable to the current media reality of digital games that come under action genres. KEY WORDS: action game, adrenaline, agon, alea, competition, digital game, fortune, game, game genres, game principles, ilinx, Mafia III, media reality, mimicry, physical and mental identity, risk, vertigo, virtual reality. ABSTRACT: Digital games can address social problems, such as the integration of marginalized persons into the community at large. For example, six children in a thousand live with an ambulatory disability. Communities must learn to accept children in wheelchairs. This social rehabilitation is problematic. It requires that hostile social environments, particularly the classroom, become more supportive. Issue awareness among classmates without disabilities can be improved by education-based interventions but such interventions rarely change behaviour. Interactive personal contact between able children and disabled role models has been shown to be eff ective but it cannot be readily scaled. Digital games off er an appealing intervention vector, easily scalable and highly interactive. This pilot study investigates game design that may promote social esteem. KEY WORDS: ATPD, game-based learning, linguistic bias, physical disabilities, serious game, social rehabilitation. ABSTRACT: The aim of the research is to investigate the correlation between age and playing styles in an authorial role-playing game. In the designed research the authors have assumed the playing styles defi ned by Richard Bartle, that is: the socializer, the killer, the achiever, the explorer. The research subjects came from three age groups: university students (18-25), corporate workers (35-50) and seniors (65+). The research was conducted with the use of the quantitative method on the basis of the playing styles observation sheet developed in accordance with the operationalization of Bartle’s taxonomy. Throughout the conducted observations one could observe clear behaviours, adequate with the operationalized taxonomy of Bartle. The dominant type in every age group was the socialiser, on the other hand only a few behaviours were associated with the killer type. In every age category there was a specifi c pattern of the observed behaviours, which are possible to explain by comparison to the everyday activities of the investigated age groups. Knowledge about the correlation between age and playing style could be useful for game creators and educators, who want to use the game as an educational method. KEY WORDS: Bartle’s taxonomy, early adulthood, LARP, late adulthood, middle adulthood, RPG. ABSTRACT: Digital games are one of the biggest cultural phenomenon of our time. From the first primitive devices, throught milestones of age, which inherited cultural status, to the newest technology – every part has its own meaning and proves that humans are playful creatures. But in digital games lies much greater potential, which can be used outside of the gaming industry, because games have an irredeemable place in the majority of the population. In current times we can even talk about gaming society and the author of this overview study sees his goal to process the historical development of digital games, analyse its current state and therefore this study could serve as the theoretical framework for further exploration, such as the future development of this area. KEY WORDS: arcade games, digital games, game industry, history, portable consoles. ABSTRACT: The author of this study suggests an idea that the auditive element of digital games is soon going to be one of the most important factors influencing their overall success, popularity, and originality. He analyses the phenomenon of binaural and ambisonic sound, its evolution and uses in the context of modern audio-visual work, primarily focusing on games. The auditive component and its increasingly important role areanalyzed in connection with the graphic design of games, virtual reality, as well as the popularity of specific games. This paper also focuses on audio-games, the use of binaural sound (which was first used on a large scale in Hellblade: Senua’s Sacrifice) and various hybrid digital games, which are balancing between classic games and audio-games. Argumentation is based on an assumption that binaural sound is the way to ambisonic sound, which (within the context of the immersive and interactive character of digital games) predestines the new standard and shows an entirely new way of creating and using digital games at the same time. All of this is reflected in the context of the graphic design of digital games and their future. KEY WORDS: ambisonic sound, binaural sound, difficulty, digital games, film, graphics, sound. ABSTRACT: Advergames have been appearing alongside digital games since the very beginning. Although they had been originally created as marketing tools, their gaming nature has made from them an important part of digital-gaming industry heritage. At the same time, advergames, which persisted over time, may represent significant advantages for the brands they promote. The aim of the study is an examination of advergames’ timelessness based on a theoretical framework and a qualitative-quantitative content analysis of advergames released across their history up to 2000, taking into account aspects of both digital games’ and advertising timelessness. Besides general popularity, archetypal character, current playability and preservation, the analysis also focuses on the advergame design and brand implementation forms. KEY WORDS: advergames, digital games, iconicity, history, participation, preservation, timelessness. ABSTRACT: Most young people living in the world of today do not express much interest in history and historical landmarks. It is therefore quite surprising that specific digital games portraying various historical periods or their alternative, partly fictitious versions might at least raise their players’ awareness of real historical facts and sites. Some of these games have been able to achieve global popularity. The author uses the digital game series Assassin’s Creed (2007 – present day) as an example of a digital gaming environment which features historical fiction merged with real historical events and figures. The aim of the study is to better understand the ways Assassin’s Creed portrays historical landmarks all over the world and bring them closer to the players. The basic assumption is that at least some of the players, here seen as potential “gamers-tourists”, may be interested in finding out more about the depicted historical sites and their true counterparts. Given the aforementioned assumption, our ambition is to discuss the digital game series Assassin’s Creed and its tendency to offer visually attractive virtual re-creations of real historical sites, reflecting on the series’ presumed ability to depict historical landmarks, figures and events in mostly fictitious, but still interesting and eye-catching ways. KEY WORDS: Assassin’s Creed series, gamer-tourist, gaming environments, historical accuracy of digital games, historical landmarks, hyper-realistic game renditions.